36 F A ll 2018 Practice l ink.com ▼ D E P A R T M E N T S PracticeLink Tips T HE C O n T r AC T S & C OMPE n SAT IO n ISSUE CH ris s C ites What's the difference in physician recruiter types? 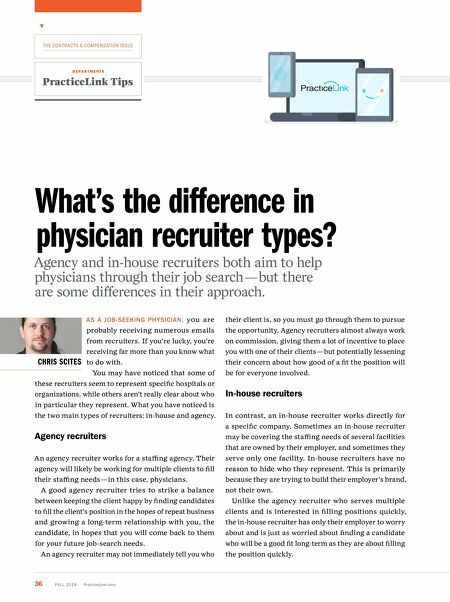 Agency and in-house recruiters both aim to help physicians through their job search — but there are some differences in their approach. as a J o B- see K in G p HY si C ian , you are probably receiving numerous emails from recruiters. If you're lucky, you're receiving far more than you know what to do with. You may have noticed that some of these recruiters seem to represent specific hospitals or organizations, while others aren't really clear about who in particular they represent. What you have noticed is the two main types of recruiters: in-house and agency. Agency recruiters An agency recruiter works for a staffing agency. 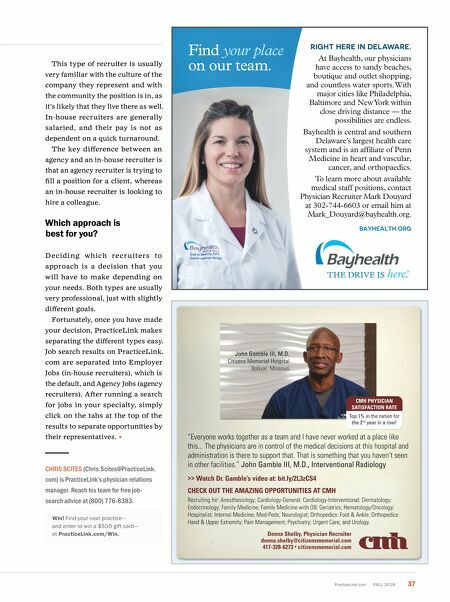 Their agency will likely be working for multiple clients to fill their staffing needs — in this case, physicians. A good agency recruiter tries to strike a balance between keeping the client happy by finding candidates to fill the client's position in the hopes of repeat business and growing a long-term relationship with you, the candidate, in hopes that you will come back to them for your future job-search needs. An agency recruiter may not immediately tell you who their client is, so you must go through them to pursue the opportunity. Agency recruiters almost always work on commission, giving them a lot of incentive to place you with one of their clients — but potentially lessening their concern about how good of a fit the position will be for everyone involved. In ‑ house recruiters In contrast, an in-house recruiter works directly for a specific company. Sometimes an in-house recruiter may be covering the staffing needs of several facilities that are owned by their employer, and sometimes they serve only one facility. In-house recruiters have no reason to hide who they represent. This is primarily because they are trying to build their employer's brand, not their own. Unlike the agency recruiter who serves multiple clients and is interested in filling positions quickly, the in-house recruiter has only their employer to worry about and is just as worried about finding a candidate who will be a good fit long-term as they are about filling the position quickly.